From the Treasure Islands blog. ". . . a giant floating startup barge anchored 12 miles off the coast of California, stocked with 1,000 entrepreneurs from around the world. The project, which may take the form of a converted cruise ship, would bring startup founders within ferry distance of Silicon Valley's key resources - venture capitalists, top talent and a business environment friendly to outlandish ideas. (Ahem.) But their offshore status would let them work without having to go through the rigamarole of obtaining U.S. visas." "While Blueseed doesn't collect taxes, any Blueseed resident will have to ensure they comply with all laws, regulations, and tax liabilities that apply to them or their firms, given their legal residence in the country whose flag Blueseed will fly (Bahamas, Marshall Islands etc.)." They don't appear to provide much detail beyond that, but that statement points to predatory tax haven behaviour, pure and simple. This is the standard policy of tax havens: 'We won't tax and regulate you - somebody, elsewhere, will do that.' Countries do put in place defences against the worst of it, but those defences are always leaky. As a result that 'elsewhere' very often means 'nowhere.' An escape route for the rich and powerful. I have long dreamed of buying an island owned by no nation and of establishing the World Headquarters of the Dow company on the truly neutral ground of such an island, beholden to no nation or society. If we were located on such truly neutral ground we could then really operate in the United States as US citizens, in Japan as Japanese citizens and in Brazil as Brazilians rather than being governed in prime by the laws of the United States. There have been similar madcap projects before by private interests to set up offshore centres, but almost always they have collapsed to the ground, for want of strong enough official support. Five months later The King of Tonga, Taufa'ahau Tupou IV, sailed there with the Tonga Defence Force, a convict work detail, and a brass band. Nobody was there, so they tore down the flag and knocked down the platform. The Abaco plot was foiled when the would-be revolutionaries were intercepted at Miami airport en route to a training mission. Oliver tried again in Vanuatu in the Pacific in 1980, joining up with separatist rebels and with John Hospers, the first Presidential candidate of the U.S. Libertarian Party, but they were thwarted this time by troops from Australia and Papua New Guinea. In fact hundreds of people, including many white, male American libertarian gun fanatics, drug-runners, Klansmen, arms dealers, mobsters, former CIA agents and Nazis – got involved in the 1970s in these and in several other similar attempts to set up free-standing, self-governed tax havens: in Costa Rica, the Azores, Haiti, the Dominican Republic, Anguilla, Vanuatu and Dominica. One group even tried to persuade Muammar Gaddafi to set up an offshore state in the Libyan desert. Every attempt failed. The adventurers may have felt unlucky, for at that very time successful new tax havens were sprouting around the world and growing explosively. But this was not about luck, for they had failed to understand a fundamental truth about offshore: for all their extreme freedoms, tax havens are created, nurtured and protected by large, powerful nation states – or, more precisely, by rich and powerful elites in those states who wish to use these offshore zones to escape rules and taxes that they resented. Think Britain and its Crown Dependencies and Overseas Territories; think China and Hong Kong; think France and Monaco; think the United States and Panama; think even Switzerland and Liechtenstein. The libertarians’ mistake every time was to try and set up uncontrolled havens outside the orbit of, and without the blessing of, a larger power. Its organizers acknowledge that much of the media attention so far has been of the you've-got-to-be-kidding-me variety. But they're making a serious effort to realize their plan. Perhaps with the offshore component stripped out, this project might be workable. 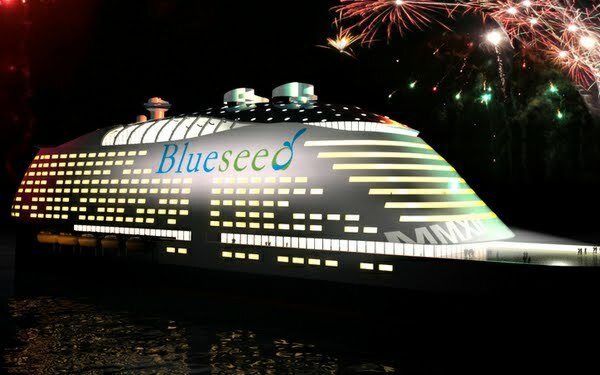 "If Blueseed is funded, they'll pay anywhere from $1,200 to $3,000 per month, plus an equity stake in their company, to live onboard." That on its own could, just perhaps, be a business proposition. The burst of offshore adventurism that emerged in the early 1970s was taking place just as a new phase of financial liberalisation and globalisation was taking off around the world. Few people knew it, but tax havens were central to a new era of globalisation and would become the most important devices used by the financial services industry to escape laws and regulations that were crimping their profits at home. Offshore centres became unregulated platforms allowing financial corporations to grow strong enough eventually to re-engineer the economic and political systems of some of the world’s major economies – most notably the United States and Britain. In the process, these countries increasingly turned themselves into tax havens as they tried to 'compete' with the offshore centres to attract the trillions of dollars in hot money sloshing in ever greater tidal waves around the world. Things have changed since the global financial crisis erupted in 2007-8. Political systems the world over are now in turmoil, as angry citizens take to the streets and demand change. The mood is steadily turning against those who would provide the world's wealthiest citizens with an escape route from tax, financial regulation and the other responsibilities of society. This is not just a tax haven. I have read a lot about this project. Many international PHD graduates with ideas that can change the world have been deported for not having the proper paperwork. Also many of their home countrys lack the materials that they may need to make an impact. Blueseed is selective in their process, and only chooses people who (a)lack proper paperwork or materials and (b)have what it takes to make a difference in the world. I don't mean to blatently disagree, as many are escaping taxes, but I hope that you can also see Blueseed as a place to collect great minds.